Come for the software, stay for the community Drupal is an open source content management platform powering millions of websites and applications. It’s built, used, and supported by an active and diverse community of people around the world. * The given URL is gated, as per the client's request. Estee Lauder is a global leader in prestige beauty — delighting its consumers with its transformative products and experiences, inspiring them to express their individual beauty. It takes pride in focussing solely on prestige makeup and beauty care with a diverse portfolio of 25+ brands distributed globally through eCommerce channelsand retail outlets sold in 150 countries. They aim to transform the beauty industry landscape with their customer service by providing modern training and understanding of the products with (digital solutions) to its teams. Srijan worked closely to design an open-source, multilingual, decoupled learning platformwhere beauty advisors could consume a vast set of learning resources. Here’s how we helped them reduce 30% cost in classroom trainingwhile also able to track ROI from the learning and training initiatives. Earlier this month we saw the passing of Rachel Olivero. Rachel touched a lot of people in both the Drupal and accessibility communities. She worked at the National Federation of the Blind, as the Director of Organizational Technology. I am not sure that this is where she was first exposed to Drupal, but she became involved in the community after attending DrupalCon in her hometown of Baltimore in 2017. It was there where she participated in her first code sprint and contributed her first bug report. After attending the first-ever Nonprofit Summit at DrupalCon Baltimore, Rachel stepped up to lead an accessibility breakout at DrupalCon Nashville. She was always willing to share her knowledge and never got annoyed no matter how many times she was asked her whether the <aside> element was ever useful to a screen reader. Fortunately, about 20 minutes of the accessibility roundtable was recorded. She engaged with a few folks throughout the week, many remember her from Drupal Trivia Night. As a technical user who was blind, her opinion was sought often in the Slack Channel. She also engaged with the Drupal Diversity and Inclusion team. Rachel was active in Twitter and other social media platforms too, where she engaged with other members of the Drupal community. As a person who was blind, transgender, and a lesbian, Rachel understood a lot about the importance of diversity. Rachel became involved in the NTEN Drupal Community of Practice calls a few years ago, when she came on a monthly call to share some accessibility knowledge. Subsequently, she became a more regular attendee of these calls. Johanna Bates and Rachel were slated to co-present a session on accessible content entry for content editors at the upcoming NTEN 19NTC in Portland. This would have been her first ever NTEN NTC. Rachel also served on the NTEN NTC’s first-ever accessibility committee, contributing her knowledge to making conferences more accessible. This is a perfect example of how willing Rachel was to share her expertise and experience with others. She was generous with her knowledge, kind, collaborative, and extremely funny. The loss of her warmth, humor, and brilliance in the Drupal community, the nonprofit tech community, and in the a11y community is a massive and sad loss. This fall Rachel contributed an article to the latest 24 accessibility series, Not Your Father’s Navigation Strategy: There’s More Than Just the TAB Key. She argued for developers to invest in proper semantic markup so that screen reader users can make full use of their assistive technology. This annual series of articles really draws on a Who's Who of accessibility. Rachel was also the president of the NFB’s Amateur Radio Division. As a modern HAM enthusiast, she was active on GitHub working to create a Software-defined radio (SDR) scanner that could continuously record a set of frequencies for on-demand playback. She was interested in public safety. Rachel had been working on NFB.org’s new Drupal 8 site for a long time. She was so excited to see it launch at the end of January. Rachel had recently been promoted at the NFB to Director of Technology. This launch was a huge piece of her work, and the site looks amazing. It is terrific to see how she was able to modernize the NFB’s website and leverage Drupal to help her create a modern responsive website. What I admired most about Rachel was her willingness to help at any level necessary and the kindness with which she acted. She was enthusiastic about building community and eager to contribute. She regularly gave time, experience, resources (like her server space, and other infrastructure) and energy to connecting people and working for a future in which technology would be accessible to all. Her unique perspective brought insight, empathy and patience to her work, and I’m sad that the world has lost such a passionate champion for inclusion. Rachel was the kind of person who immediately made you feel at ease when you were spending time with her, even if you had just met. She was great about making sure that nobody got left out, and was quick to invite new or shy people at events who might have eaten alone to come sit with her and her friends instead. She was generous with her time whenever I asked to bounce an idea off of her to see if what I was considering suggesting would actually be helpful for the blind community or not, and she never made me feel like a bother when I asked for her thoughts. To the contrary, she always seemed happy to help. She was encouraging when I was right, and gracious when I was wrong; she never made me feel stupid about an idea if I was off-base, and instead provided valuable insight that I apply to my work to this day. Rachel was an awesome woman, and I wish that we had gotten to spend more time together. The Drupal community (and the world at large) will definitely be feeling her loss. I hope that we can all put what she has given to each of us to good use to carry forward what was always her mission - to make the world better for people. Rachel Olivero was really an adventurous spirit. I remember a NFB conference several years ago when Rachel mused "I've always wanted to ride a mechanical bull - y'know do as Texans do in Texas". After fighting the management of the establishment, who were not inclined to let her ride, she got to ride - for a full 30 seconds:-). Everyone at Deque will miss her. Rachel is an inspiration to all those who strive to be true to themselves and the cause of digital equality. In 2007, Rachel was one of the first accessibility experts I worked with after I joined Deque and I was always impressed with her technical strength and her ability to keep people at the center of any discussion. I remember the demonstration she made to Wal-Mart’s checkout team, that the shopping cart was inaccessible. Their response was getting off-track into technical mumbo-jumbo when Rachel loudly interrupted, “excuse me...excuse me. The point is that I want to put money in your pocket but since the shopping cart won’t work for me, I can’t do that. Do you want me to put my money in Target’s pocket instead?!? !” I always enjoyed working with her on any project and will miss her. Rachel Olivero will always be an an accessibility super hero to me. From the moment I met her, I knew she was wicked smart and a powerful force for good. She moved a11y forward through her technical work and leadership at NFB and Humana. Our friendship grew each time we were together...from AHG to NFB to CSUN, to Penn State Web Conf and more. I think some of my favorite memories are from the “accessibility slumber party” at the Margarita Inn with Rachel, Elle, Sharron and others. Elle had brought together a team of a11y experts to solve big problems...we worked night and day...because we care so deeply about equal access for all. A world without Rachel seems impossible to me. And then I remember how with Rachel, nothing seemed impossible. So I guess we all have to find our way to keep Rachel’s positive energy moving forward. Now It is up to each of us to make Rachel’s a11y dreams become a reality. I enjoyed talking with Rachel at both of her DrupalCons. We mostly talked shop. I was very impressed with her knowledge and patience dealing with people interested in learning. I remember talking about getting organizations like the NFB to approach technology more as makers than consumers. We also talked about challenges with procurement and the work that she was doing to revise how technology was purchased. She seemed hopeful and focused. She was clearly a big thinker. By being involved in the Drupal community, Rachel reminded a lot of us of the importance of building our tools to work for everyone. We were all looking forward to working with her more. She will be missed. In lieu of flowers, the family requests that memorial donations be made to the National Federation of the Blind to support projects in which Rachel personally invested her time, treasure, and talent. Contributions can be mailed to National Federation of the Blind, 200 East Wells Street, Baltimore, Maryland, 21230, or given online at https://nfb.org/donate. This blog has been re-posted and edited with permission from Dries Buytaert's blog. Unfortunately Dries' blog does not allow for comments at the moment, feel free to post them here. At Drupal Europe, I announced that Drupal 9 will be released in 2020. 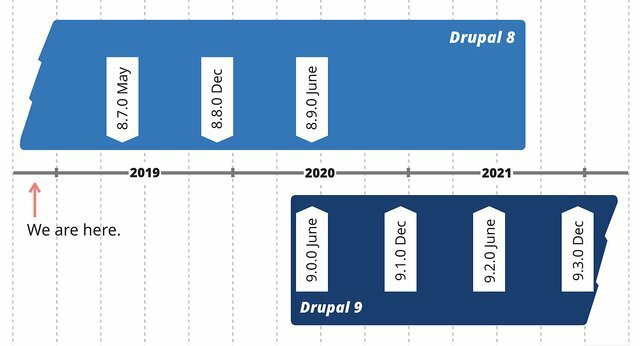 Although I explained why we plan to release in 2020, I wasn't very specific about when we plan to release Drupal 9 in 2020. Given that 2020 is less than thirteen months away (gasp! ), it's time to be more specific. We shifted Drupal 8's minor release windows so we can adopt Symfony's releases faster. Before I talk about the Drupal 9 release date, I want to explain another change we made, which has a minor impact on the Drupal 9 release date. As announced over two years ago, Drupal 8 adopted a 6-month release cycle (two releases a year). Symfony, a PHP framework which Drupal depends on, uses a similar release schedule. Unfortunately the timing of Drupal's releases has historically occurred 1-2 months before Symfony's releases, which forces us to wait six months to adopt the latest Symfony release. To be able to adopt the latest Symfony releases faster, we are moving Drupal's minor releases to June and December. This will allow us to adopt the latest Symfony releases within one month. For example, Drupal 8.8.0 is now scheduled for December 2019. Drupal 8's biggest dependency is Symfony 3, which has an end-of-life date in November 2021. This means that after November 2021, security bugs in Symfony 3 will not get fixed. Therefore, we have to end-of-life Drupal 8 no later than November 2021. Or put differently, by November 2021, everyone should be on Drupal 9. Working backwards from November 2021, we'd like to give site owners at least one year to upgrade from Drupal 8 to Drupal 9. While we could release Drupal 9 in December 2020, we decided it was better to try to release Drupal 9 on June 3, 2020. This gives site owners 18 months to upgrade. Plus, it also gives the Drupal core contributors an extra buffer in case we can't finish Drupal 9 in time for a summer release. Planned Drupal 8 and 9 minor release dates. Instead of working on Drupal 9 in a separate codebase, we are building Drupal 9 in Drupal 8. This means that we are adding new functionality as backwards-compatible code and experimental features. Once the code becomes stable, we deprecate any old functionality. Let's look at an example. As mentioned, Drupal 8 currently depends on Symfony 3. Our plan is to release Drupal 9 with Symfony 4 or 5. Symfony 5's release is less than one year away, while Symfony 4 was released a year ago. Ideally Drupal 9 would ship with Symfony 5, both for the latest Symfony improvements and for longer support. However, Symfony 5 hasn't been released yet, so we don't know the scope of its changes, and we will have limited time to try to adopt it before Symfony 3's end-of-life. We are currently working on making it possible to run Drupal 8 with Symfony 4 (without requiring it). Supporting Symfony 4 is a valuable stepping stone to Symfony 5 as it brings new capabilities for sites that choose to use it, and it eases the amount of Symfony 5 upgrade work to do for Drupal core developers. In the end, our goal is for Drupal 8 to work with Symfony 3, 4 or 5 so we can identify and fix any issues before we start requiring Symfony 4 or 5 in Drupal 9. Another example is our support for reusable media. Drupal 8.0.0 launched without a media library. We are currently working on adding a media library to Drupal 8 so content authors can select pre-existing media from a library and easily embed them in their posts. Once the media library becomes stable, we can deprecate the use of the old file upload functionality and make the new media library the default experience. Because we are building Drupal 9 in Drupal 8, the technology in Drupal 9 will have been battle-tested in Drupal 8. For Drupal core contributors, this means that we have a limited set of tasks to do in Drupal 9 itself before we can release it. Releasing Drupal 9 will only depend on removing deprecated functionality and upgrading Drupal's dependencies, such as Symfony. This will make the release timing more predictable and the release quality more robust. For contributed module authors, it means they already have the new technology at their service, so they can work on Drupal 9 compatibility earlier (e.g. they can start updating their media modules to use the new media library before Drupal 9 is released). Finally, their Drupal 8 know-how will remain highly relevant in Drupal 9, as there will not be a dramatic change in how Drupal is built. But most importantly, for Drupal site owners, this means that it should be much easier to upgrade to Drupal 9 than it was to upgrade to Drupal 8. Drupal 9 will simply be the last version of Drupal 8, with its deprecations removed. This means we will not introduce new, backwards-compatibility breaking APIs or features in Drupal 9 except for our dependency updates. As long as modules and themes stay up-to-date with the latest Drupal 8 APIs, the upgrade to Drupal 9 should be easy. Therefore, we believe that a 12- to 18-month upgrade period should suffice. So what is the big deal about Drupal 9, then? The big deal about Drupal 9 is … that it should not be a big deal. The best way to be ready for Drupal 9 is to keep up with Drupal 8 updates. Make sure you are not using deprecated modules and APIs, and where possible, use the latest versions of dependencies. If you do that, your upgrade experience will be smooth, and that is a big deal for us. Special thanks to Gábor Hojtsy (Acquia), Angie Byron (Acquia), xjm(Acquia), and catch for their input in this blog post. This blog has been re-posted and edited with permission from Dries Buytaert's blog. Please leave your comments on the original post. Last week, WordPress Tavern picked up my blog post about Drupal 8's upcoming Layout Builder. 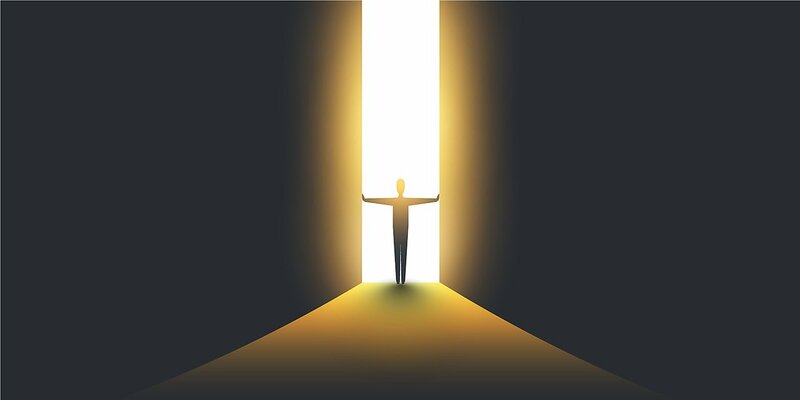 While I'm grateful that WordPress Tavern covered Drupal's Layout Builder, it is not surprising that the majority of WordPress Tavern's blog post alludes to the potential challenges with accessibility. After all, Gutenberg's lack of accessibility has been a big topic of debate, and a point of frustration in the WordPress community. I understand why organizations might be tempted to de-prioritize accessibility. Making a complex web application accessible can be a lot of work, and the pressure to ship early can be high. In the past, I've been tempted to skip accessibility features myself. I believed that because accessibility features benefited a small group of people only, they could come in a follow-up release. Today, I've come to believe that accessibility is not something you do for a small group of people. Accessibility is about promoting inclusion. When the product you use daily is accessible, it means that we all get to work with a greater number and a greater variety of colleagues. Accessibility benefits everyone. As you can see in Drupal's Values and Principles, we are committed to building software that everyone can use. Accessibility should always be a priority. Making capabilities like the Layout Builder accessible is core to Drupal's DNA. Drupal's Values and Principles translate into our development process, as what we call an accessibility gate, where we set a clearly defined "must-have bar." Prioritizing accessibility also means that we commit to trying to iteratively improve accessibility beyond that minimum over time. Our first priority is WCAG 2.0 AA conformance. This means that in order to be released as a stable system, the Layout Builder must reach Level AA conformance with WCAG. Without WCAG 2.0 AA conformance, we won't release a stable version of Layout Builder. Our next priority is WCAG 2.1 AA conformance. We're thrilled at the greater inclusion provided by these new guidelines, and will strive to achieve as much of it as we can before release. Because these guidelines are still new (formally approved in June 2018), we won't hold up releasing the stable version of Layout Builder on them, but are committed to implementing them as quickly as we're able to, even if some of the items are after initial release. While WCAG AAA conformance is not something currently being pursued, there are aspects of AAA that we are discussing adopting in the future. For example, the new 2.1 AAA "Animations from Interactions", which can be framed as an achievable design constraint: anywhere an animation is used, we must ensure designs are understandable/operable for those who cannot or choose not to use animations. Drupal's commitment to accessibility is one of the things that makes Drupal's upcoming Layout Builder special: it will not only bring tremendous and new capabilities to Drupal, it will also do so without excluding a large portion of current and potential users. We all benefit from that! Last week, I shared my State of Drupal presentation at Drupalcon Nashville. In addition to sharing my slides, I wanted to provide more information on how you can participate in the various initiatives presented in my keynote, such as growing Drupal adoption or evolving our community values and principles. During the first portion of my presentation, I provided an overview of Drupal 8 updates. Last month, the Drupal community celebrated an important milestone with the successful release of Drupal 8.5, which ships with improved features for content creators, site builders, and developers. This graph depicts the number of Drupal 8 sites built since April 2015. Last year there were 159,000 sites and this year there are 241,000 sites, representing a 51% increase year-over-year. This graph depicts the number of modules now stable since January 2016. This time last year there were 1,028 stable projects and this year there are 1,860 stable projects, representing an 81% increase year-over-year. This roadmap depicts Drupal 8.5, 8.6, and 8.7+, along with a column for "wishlist" items that are not yet formally slotted. The contents of this roadmap can be found at https://www.drupal.org/core/roadmap. Drupal 8 was released at the end of 2015, which means our community has had over two years of real-world experience with Drupal 8. It was time to take a step back and assess additional growth initiatives based on what we have learned so far. In an effort to better understand the biggest hurdles facing Drupal adoption, we interviewed over 150 individuals around the world that hold different roles within the community. We talked to Drupal front-end and back-end developers, contributors, trainers, agency owners, vendors that sell Drupal to customers, end users, and more. Based on their feedback, we established four goals to help accelerate Drupal adoption. Matthew Grasmick recently completed an exercise in which he assessed the technical evaluator experience of four different PHP frameworks, and discovered that Drupal required the most steps to install. Having a good technical evaluator experience is critical, as it has a direct impact on adoption rates. To become involved with one of these initiatives, click on its "Issue link" in the table above. This will take you to Drupal.org, where you can contribute by sharing your ideas or lending your expertise to move an initiative forward. Throughout the interview process, it became clear that ease of use is a feature now expected of all technology. For Drupal, this means improving the content creator experience through a modern administration user interface, drag-and-drop media management and page building, and improved site preview functionality. Most of these initiative teams meet weekly on Drupal Slack (see the meetings calendar), which gives community members an opportunity to meet team members, receive information on current goals and priorities, and volunteer to contribute code, testing, design, communications, and more. The configuration management capabilities in core need to support more common use cases out-of-the-box. Composer and Drupal core should be better integrated to empower site builders to manage dependencies and keep Drupal sites up-to-date. We should provide a longer grace period between required core updates so development teams have more time to prepare, test, and upgrade their Drupal sites after each new minor Drupal release. The fourth initiative is unique as it will help our community to better communicate the value of Drupal to the non-technical decision makers. Today, marketing executives and content creators often influence the decision behind what CMS an organization will use. However, many of these individuals are not familiar with Drupal or are discouraged by the misconception that Drupal is primarily for developers. With these challenges in mind, the Drupal Association has launched the Promote Drupal Initiative. This initiative will include building stronger marketing and branding, demos, events, and public relations resources that digital agencies and local associations can use to promote Drupal. The Drupal Association has set a goal of fundraising $100,000 to support this initiative, including the hiring of a marketing coordinator. Megan Sanicki and her team have already raised $54,000 from over 30 agencies and 5 individual sponsors in only 4 days. Clearly this initiative resonates with Drupal agencies. Please consider how you or your organization can contribute. This year at DrupalCon Nashville, over 3,000 people traveled to the Music City to collaborate, learn, and connect with one another. It's at events like DrupalCon where the impact of our community becomes tangible for many. It also serves as an important reminder that while Drupal has grown a great deal since the early days, the work needed to scale our community is never done. Prompted by feedback from our community, I have spent the past five months trying to better establish the Drupal community's principles and values. I have shared an "alpha" version of Drupal's values and principles at https://www.drupal.org/about/values-and-principles. As a next step, I will be drafting a charter for a new working group that will be responsible for maintaining and improving our values and principles. In the meantime, I invite every community member to provide feedback in the issue queue of the Drupal governance project. An overview of Drupal's values with supporting principles. I believe that taking time to highlight community members that exemplify each principle can make the proposed framework more accessible. That is why it was very meaningful for me to spotlight three Drupal community members that demonstrate these principles. In addition to the community spotlights, you can also watch a recording of my keynote (starting at 19:25), or you can download a copy of my slides (164 MB). "I enjoyed this class. Speaker was very knowledgeable. Very practical and everyday applicable." - Tom Bascom, White Star Software, LLC on Mike Lonski's "Pick An Index, Any Index"